Every now and then I get a wild hair and decide to do something big and bold. What better way to test my boundaries than with a gigantic kiln carving? This piece was created for the Nature of Sustainable Art show at Red Butte Garden that is up through the end of February. 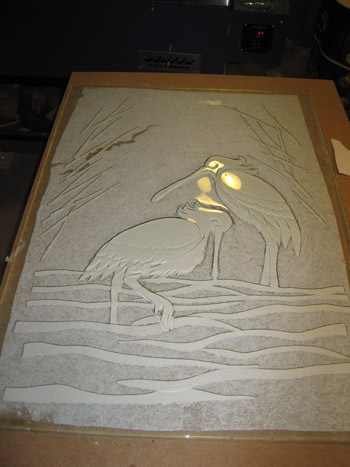 Spoonbill cranes for kiln carved recycled glass panel. 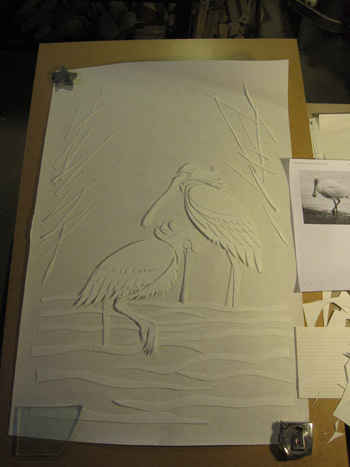 The cranes are made of multiple layers of 1/32″ thick fiber paper cut freehand and stacked for dimension. The entire fiber paper pattern is built up on a sheet of thinfire, so I can lift and transfer the whole thing to the kiln shelf and avoid leaning over into the kiln for hours! The paper on the right hand side is a regular 8/5″ x 11″ sheet, and is my reference photo for the cranes. 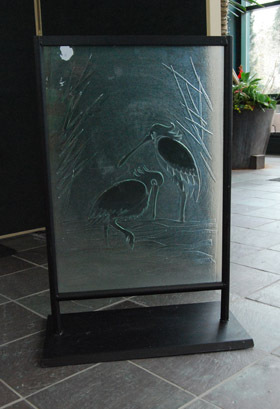 The glass for the crane panel is 22.5″ x 37″ recycled float glass. Kiln carved cranes after firing (look at the monkeys!). 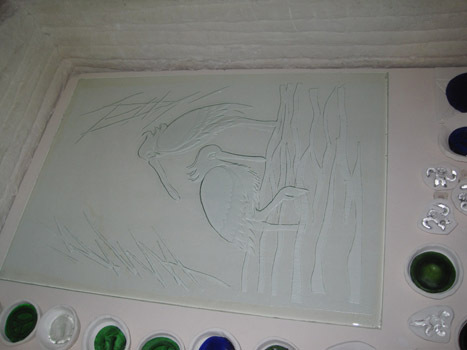 Kiln carved Crane panel after firing. Kiln carved spoon bill cranes in steel stand.